It turned out to be the perfect way to end the ‘affair’: Patrick Sellelslagh’s SRT took a 1-2 at Spa last weekend, in the penultimate race of the Belcar season – and now with consecutive FFSA GT events on the next two weekends, the second one clashing with the final Belcar event on October 21-22, SRT will miss the Zolder meeting, as it concentrates on FFSA GTs, at Le Mans (this weekend) and Magny-Cours. The team will enter its two C5-Rs at both races. So Le Mans (the Bugatti Circuit) will see the two Ambi-Pur and Williams-liveried cars driven by Guino Kenis / Eric Cayrolle, and Romain Brandella / Thierry Stepec. 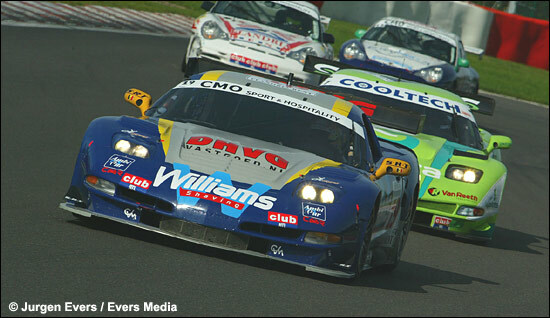 Magny-Cours will see the usual FFSA GT pairings of Bouchut / Berville and Soave / Cayrolle in the blue Corvettes. “I absolutely want to offer Patrick a first victory in the FFSA GT,” says the combative Christophe Bouchut – a winner last weekend at Spa, with Jan Heylen.